After spending two days in the hill station of Munnar, we reached Kumily late in the evening. First thing was to find a good accommodation. After that, we went to explore the little town of Kumily. There was an Information Centre at Ambadi Junction. We inquired about all the Eco Tourism options. There were Nature Walk and Green Walk which were meant to provide an excellent opportunity to watch birds, butterflies and other wildlife. These were 4 to 5 km trek in the dense forests. Then there was Jungle Scout in which you can experience the wilderness of jungle at night. Also, there was Tiger Trail, the most adventurous and lengthiest stay in the jungle. A group of six would be accompanied by 5 ex-poachers and one armed guard. But we settled for the Bamboo Rafting because this was the one in which you get to go deepest in the jungle and get the panoramic view of the forest. When we asked the person at the counter to book tickets for Bamboo Rafting, he said that it's too late. He had already sent the list of persons for rafting and as arrangements for food and all had to be made, he could not accommodate any more. We decided then to go for boating in Periyar Lake in the morning and later in the day for Green Walk. Periyar National Park and Wildlife Sanctuary came into existence in 1982. Spread over an area of 925 sq. km in the Western Ghats in Kerala and Tamil Nadu, it is an important part of Project Elephant and Project Tiger. Located high in the mountainous area of Cardamom Hills, the park surrounds the Periyar Lake which got created after Mullaperiyar Dam was erected. Next day we woke up early. There was a long queue at the counter of national park entrance to get the entry tickets. A long line of vehicles could be seen in front of the gate. Everybody wanted to get the first slot of boating at 7:30 am. When entry was allowed, we booked an auto, which was ahead of the most of the other vehicles, just to reach inside quickly. A jeep of forest department was guiding a long motorcade, which looked interesting. Then after a point vehicles could go no further. We ran for about 800 metres and luckily were among the first few persons to reach the counter where tickets for boating could be availed. The only reason for this exercise was that during morning hours sighting of wild animals was more probable compared to other slots of the boating. At the scheduled time our boat, Jal Tharangini, left the shores. In a cool weather with a slight hint of mist, this was going to be a nice experience. We took our seats on the top floor of the boat. The lake had submerged trees, which had their black stem standing alone in the lake, acting as a route guide. There was one guide on the boat who showed whatever little wildlife he could find to show us. We could spot a Kingfisher sitting on the top of those submerged trees. What was surprising was that few birds had their nests on the top of these stems of submerged trees. Surely an odd place to lay eggs. We could also spot three to four gaurs, also called Indian bison, at a distance. There was one elephant which came out of the forests to lake shores for few minutes. This much wildlife we could see during the boating. That apart, boating experience itself was very good. At times, we felt like rain could start any moment, but that did not happen and weather remained pleasant. We again went to Information Centre at Ambadi Junction and booked tickets for Green Walk. At the start of Green Walk we were given a piece of cloth to be worn below knees to protect from leeches. Our guide, Wilson, introduced us about the tribes in the national park. Those tribes were living there for centuries and these forests were a major source of living for them. Starting from metalled roads we soon entered the trails in the forest. The chirruping of birds accompanied us the whole time. Wilson, guessing by the smell in the air, said that a parade of elephants must have passed this area little before us. Soon after that, our guide started following the footmarks of elephant and this jungle trek became for its initial part, an elephant trail walk. Wilson even asked local women collecting firewood in the jungle about elephants and depending upon their input he changed the course. Pointing to a heap of firewood kept at a place, Wilson said that an elephant must have arrived there forcing the tribal women to leave the area without taking firewood with them. During our trek, we walked the plains, climbed up the hills, crossed narrow water streams. In fact, this showed that how a forest free from human occupation can retain its beauty and variety. On top of the hills, there were old cotton trees, with interesting shapes of stems. In a nutshell, this was a rare opportunity to see a forest from deep inside. After boating and jungle trekking, our visit to Periyar Tiger Reserve was coming to an end. You have to be very lucky to see wildlife during a visit to any wildlife sanctuary and same was the case with our visit to this national park. We could not see tigers, which lived deep in the forests as told by our guide. 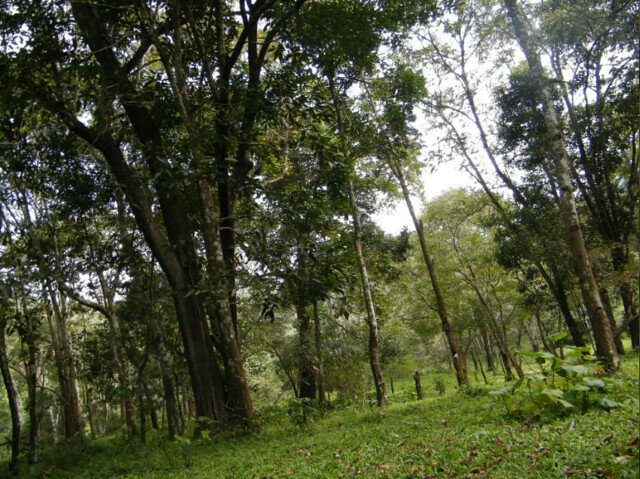 Most of the Eco Tourism offered by Kerala Forest Department covers the periphery of the park only. There was no herd of elephants to be seen. It was a refreshing trip because of nice weather. We then left Kumily for Kollam located at a distance of more than 160 km. See Photos of Periyar Tiger Reserve, Thekkady, Kerala also. Find pictures of Eravikulam National Park, Munnar on Flickr here.